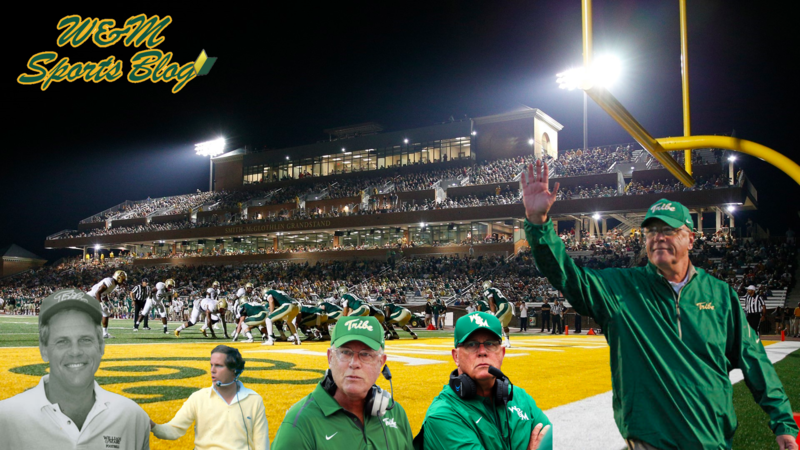 For the last several decades, there has been one overarching, pervasive presence that has all but defined the William & Mary Tribe football experience. A humble man from Northern Virginia’s Loudoun County, he got his start in Williamsburg following a successful high school football career. As a quarterback for the Tribe, he would learn from two all-time great head coaches in Marv Levy and Lou Holtz. Following graduation, and after a few assistant coaching gigs, he would return to his alma mater in 1980 as its Head Coach. He was just 32 years old. Now 70 years young, he’s hanging up the cleats with over 200 wins to his name. Joe Paterno. Bobby Bowden. Frank Beamer. Bear Bryant. If William & Mary Head Coach Jimmye Laycock were to enter his name among college football’s all-time elite head coaches, he would outrank all but one in terms of longest coaching tenure. 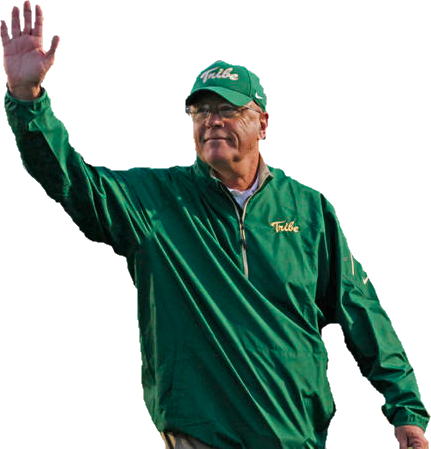 Wrapping up his 39th season at the helm for the Tribe this season, Laycock has spent more seasons at W&M than Bowden (FSU, 34 years), Beamer (VT, 29 years), and Bryant (Alabama, 25 years) did at their respective schools, trailing only Joe Paterno (PSU, 46 years). In 1951, well before Laycock’s time, William & Mary’s football program was shaken to its core by an academic scandal; upon review, the school found that player transcripts were falsified (not unlike UNC’s issues in 2010). Prior to the scandal, W&M football was on the rise — and no, not just regionally, but nationally. From 1940 to 1950, W&M boasted 44 consecutive victories against in-state competitors. Now stop and let that sink in: 44 wins against in-state schools (Virginia, Richmond, Virginia Tech, etc.). However, once the aforementioned transcripts were discovered, it’s not hyperbole to say that the program began a 30-year downward spiral. From 1952-1980, the school amassed more than 5 wins just 4 times. That is, until Jimmye Laycock arrived in 1980. Nearly 40 years into his tenure, having amassed an eye-popping 249-193-2 record and 10 playoff appearances, one can begin to understand the impact of his accomplishments. To say that the situation was bad when he got here would be an understatement. When Laycock took over, the football program had facilities so poor that it held practice on the fields of a nearby mental institution. Let that sink in…would you have taken the job? Lucky for us, Laycock didn’t take his friend’s advice. The number of players and coaches that Laycock has mentored throughout the years is, quite literally, too large to count. In fact, this Saturday, early reports are estimating that about 350 of his former players will be in attendance for his final game, appropriately coming against arch-rival Richmond. An overarching goal of Laycock’s over the past four decades has been to produce true scholar-athletes. And he has more than succeeded in that goal. Bring in the right people — men who work hard on the field, but who work and study even harder off of it. This emphasis on character is something that escapes most collegiate programs in today’s era, most of which are simply looking to win games at all costs. Perhaps most impressive about Laycock has been his aversion to that mindset. And that’s just one story, of hundreds more, that you’ll continue to hear well after Laycock is gone. In 1990, 10 years into his tenure at W&M, Boston College offered Laycock a 300% raise to take over their program; Laycock initially accepted the offer. Laycock’s family was an overriding factor in his decision, colleagues said. “It’s the ties here, it’s the people here, it’s the family here, it’s the degree of comfort you have here, it’s the players you have here,” Laycock said. The Boston College job was eventually filled by Tom Coughlin; over three seasons, Coughlin would lead the Eagles to a 21-13-1 record, which included a program-altering win over the #1-ranked Notre Dame Fighting Irish. Following the 1993 season, Coughlin moved to the NFL, where he would lead the New York Giants to two Super Bowl victories as Head Coach. But Laycock doesn’t think about what could have been. His impact on our alma mater’s football program, and the College in general, serves as a reminder to us all about what it means to be a member of the Tribe. Do things the right way. Work hard. Stay the course. Love your school. Help others. Simply put, his love for W&M far outweighed any amount of money that could be thrown his way — even a 300% bonus. We’re happy to have been along for the ride. A great coach is retiring! I wish him the best. Just not is Saturday!